World Jewish Congress President Ronald S. Lauder said: “The World Jewish Congress, representing 100 Jewish communities on six continents, is deeply committed to the State of Israel and its citizens. This manifesto is a declaration of our promise to continue to defend and promote the Jewish state, and to stand by and assist in ensuring its bright and secure future". 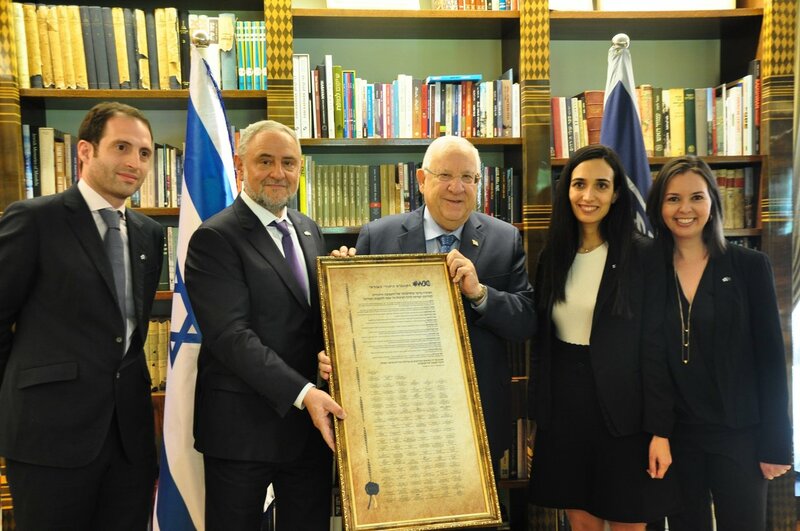 The declaration, designed in the format of Israel’s original Declaration of Independence, was delivered to Israeli President Reuven Rivlin by a World Jewish Congress delegation led by WJC CEO Robert Singer and representatives of the WJC’s flagship program, the WJC-Jewish Diplomatic Corps - the future leaders of Jewish communities worldwide. Upon accepting the declaration, Israeli President Reuven Rivlin said: "At the root of our relationship as the Jewish people there is one simple, absolute understanding that must prevail: our mutual responsibility for one another; our commitment to the security, liberty, and welfare of every member of our people. This commitment must be stronger than any disagreement. We have the challenge of cementing the ties between us as a value that stands beyond any debate. Our relationship must always stand at the heart of Jewish existence, a mission that is part of the State of Israel’s commitment to the Jewish people. I am pleased to accept this moving declaration, a simple proof of this mutual responsibility that we must never forgo." 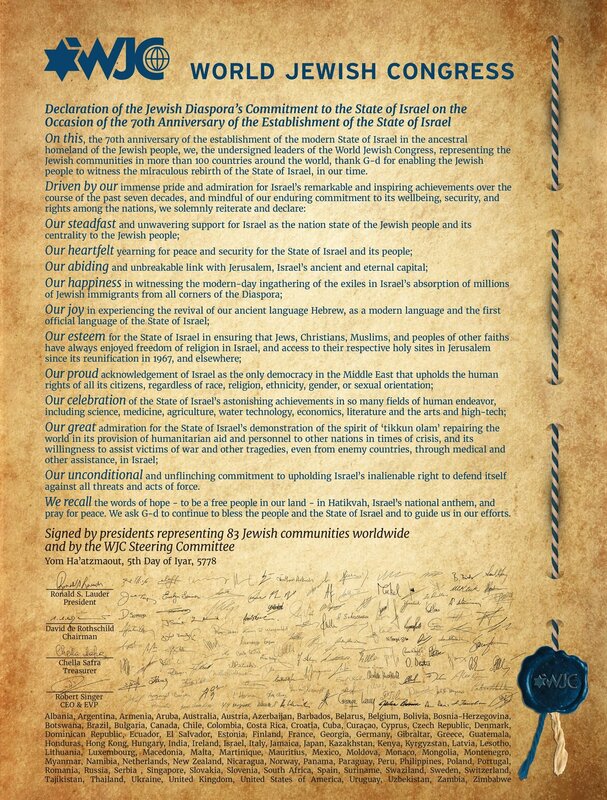 Signatories to the declaration include the leaders of Jewish communities from countries as diverse as Australia, Argentina, Canada, Colombia, Cuba, France, Greece, Hungary, Italy, Latvia, Mexico, Montenegro Peru, Romania, Russia, South Africa, the United Kingdom, the United States, and more. The full Declaration will be issued to the public on Wednesday, the eve of Israel’s 70thIndependence Day.